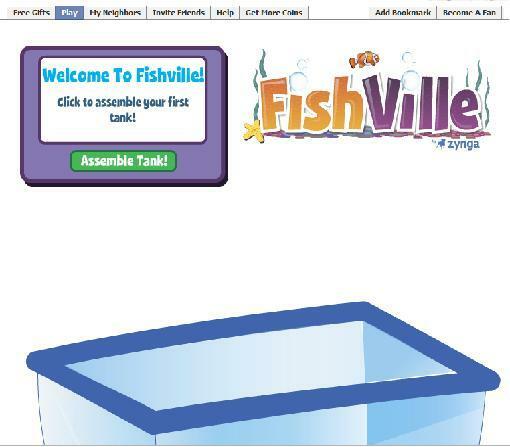 Will Fishville Become a Phenomenal Game Like Farmville. That Remains to be Seen. The mercurial rise of Farmville in the online gaming scene around the world was indeed fascinating and spellbinding. Millions of Facebook users enjoyed this 2D game with so much passion and devotion, as they farm their way to earn coveted Farmville coins and Farmville Value as much as they could. Moreover, Farmville gamers are glued to their respective computers to look after their crops to see if they are ready for a harvest after series of plowing and planting, or simply to decorate their farm with so much care and creativity or get the chance to earn experience points to help raise their levels up further to unlock high-level buildings, trees and decorations and eventually gaining access to produce or crops that could give them good yield. 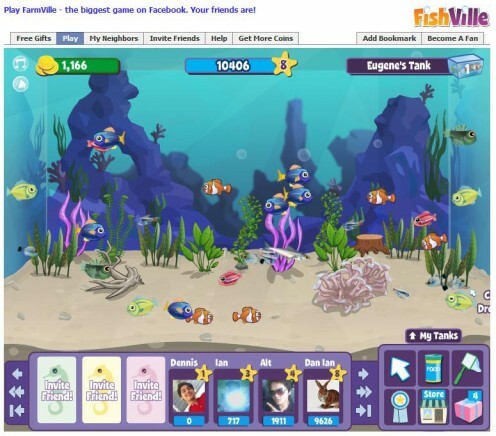 Zynga, the genius behind the phenomenal success of Farmville, seemed unstoppable and riding to the momentum it build for the past few months recently unveiled another online game, the Fishville which is tailored to captivate the imagination and interests of the online players. A truly welcome development to all online game aficionados and fish tanks enthusiasts. 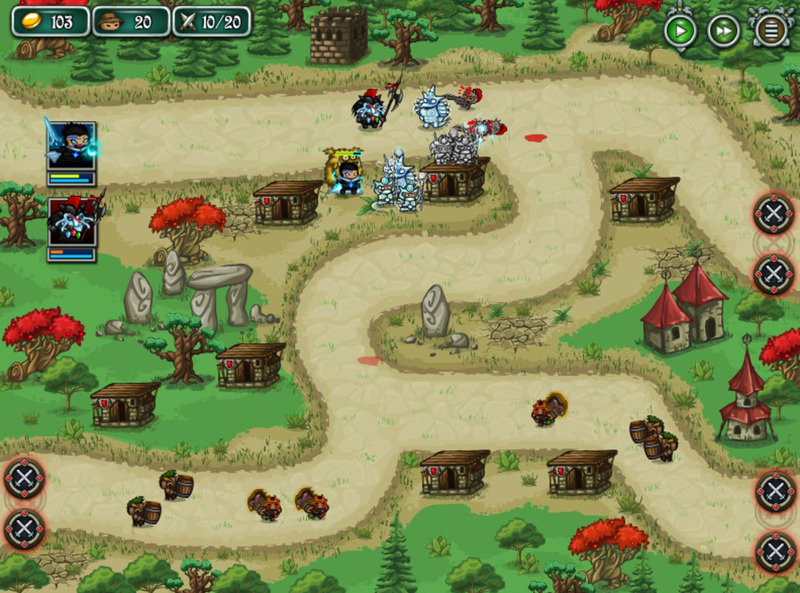 Fishville is a promising game and is filled with twists and even similarities to its cousin Farmville. Now let’s take a quick peek of Fishville, a game that is poised to make a great stride. 1. The setting is in the fish tank (of course and you can have five aquariums as your level progresses) and all you need to do is buy fish egg(s) that will instantly transform to juvenile fish and eventually can be sold for coins and experience upon reaching maturity. Fishville environment is similar to Farmville so as to speak. 2. The Graphics User Interface of Fishville is clear and like its counterpart Farmville is also pleasant to look. at The fishes are all animated, as they simulate the movements of fishes with grace like swimming, feeding in a frenzy fashion and the fishes acts as if they school well. The sound effect of the fish tanks in Fishville also depicts the sound generated by real aquariums and it is reinforced with a soothing background music. 3. Fishes comes in with vivid and attractive hues and colors as they combine to create an explosive showcase of a truly entertaining and mind refreshing fish tanks that could give the gamers a greatt dose of “Fish Therapy.” Variety never fails to be in Zynga’s cup of tea in producing a top notch online game. Fishes comes in a wide array of colors, shapes and sizes. 4. Fishville is as user-friendly as Farmville and perhaps even more, since there’s no need for you to plow, plant and harvest lots of crops (so also, trees and animals are harvested in Farmville). In Fishville all you need to do is buy a fish of your choice then release them in the tanks to become eggs that will turn into juvenile fishes and when it matures, voila, you could sell them for experience points and coins. 5. 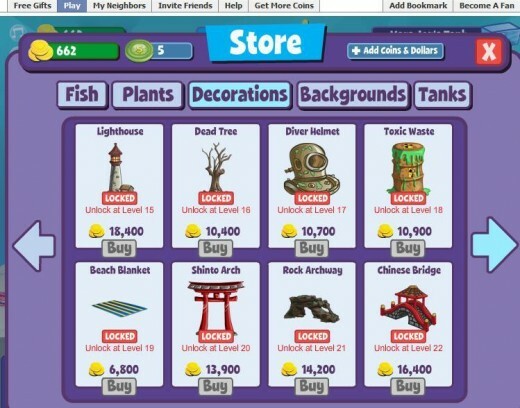 Great news for Fishville users and would be users, Fishville is similar to Farmville when it comes to the gaming environment. Fishville will show you a short yet very easy to follow guidelines/tutorials to learn the game the first time you’ll play it. The short guidelines/tutorials is consists of three fundamental things you need to know in playing Fishville – buy, feed and harvest fishes. To play Fishville make sure you have a Facebook account to have an access to the game. 6. Plants can be purchase and sold anytime you wish to add a nice backdrop to your aquarium. 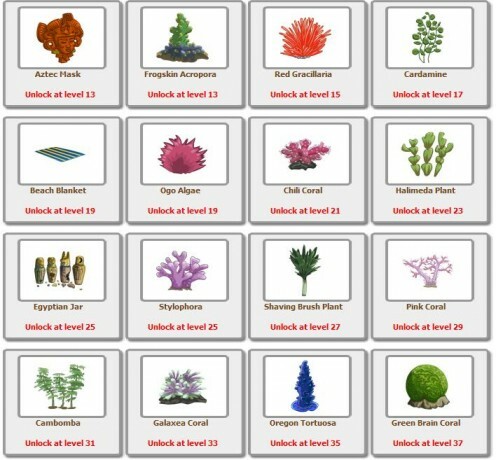 Plants gives you experience points when purchased and used aside from making your aquarium very attractive and nice to look at. 8. Neighbors are extremely important in Fishville (just like Farmville) for they will help you level up with their gifts and to unlock expansions as you level up with your game play. 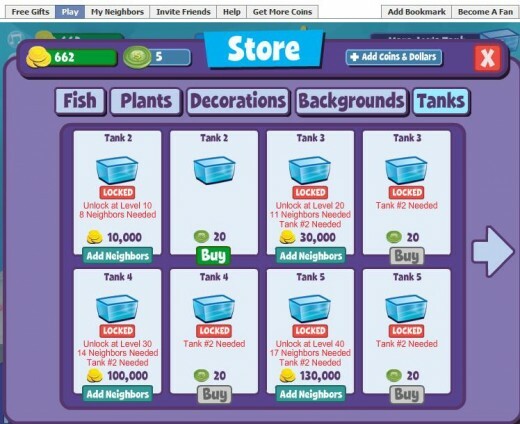 Expansions gives you privilege to accommodate a large number of fishes but you need particular number of neighbors to unlock them. Visiting neighbors also gives you extra coins and experience. 9. 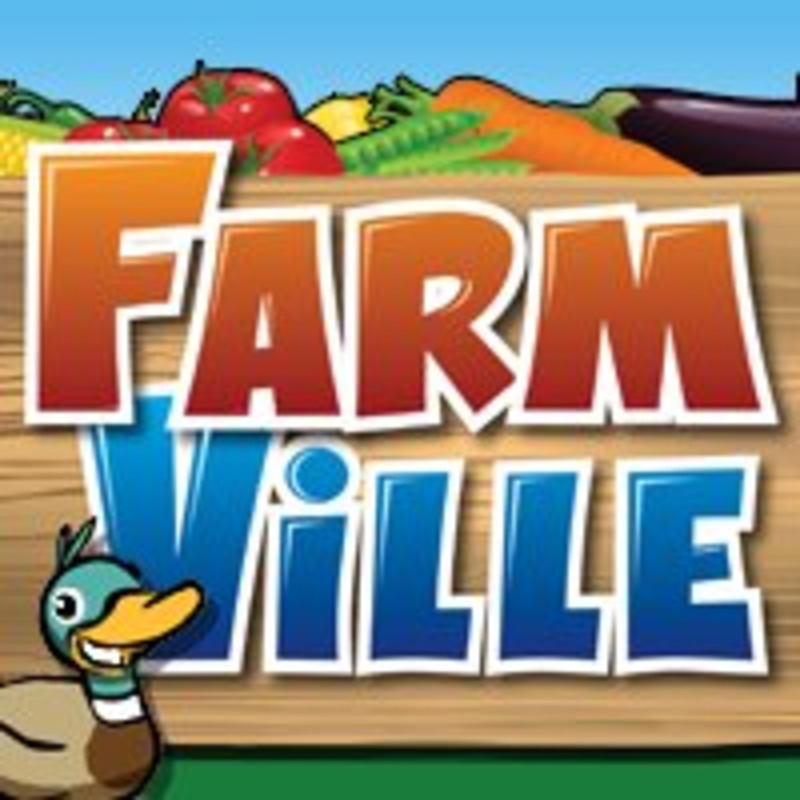 Fishville is a perfect compliment to Farmville; you can play both of these two games with gusto at the same time. 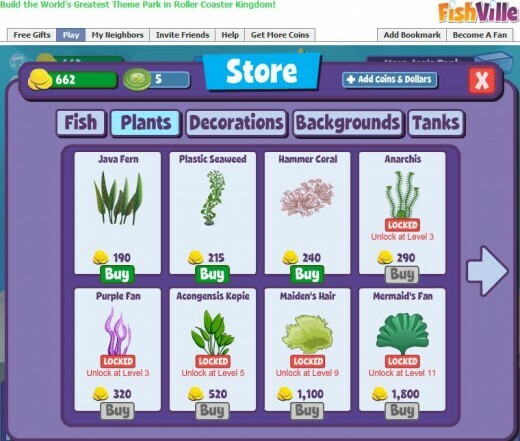 What is good with Fishville is that you can raise fishes (fast fishes) and then sell them after few minutes such as Sardines (a very fast rate at 3 minutes), Mini Dart Goby (5 minutes) and Red Spot Cardinal (15 minutes), to earn coins and experience immediately while waiting for your crops to be harvested in Farmville. 10. As a tropical fish enthusiast (the author of this hub GeneralHowitzer is fond of tetra, cichlid and gourami fish types). I wonder why the creator of this game is integrating tropical fish types with the salt-water types in a single aquarium, this is impossible in real life though, hehehe. On the second thought however, this is a game that is bound to give players exhilirating excitement and enjoyment, this flaw of Fishville will eventually ignored, for what it counts most is we have another truly enjoying game, Fishville that is, which is bound to capture and give pleasure to young ones and young at heart players. Then once you have a Facebook account start playing the game by clicking the link below. 2. Click Assemble the tank. You may publish this in the wall of your Facebook main page or not. Then Click next to get to you to the game right away. The subtle Fishville environment, filled high-definition video effects and clarity. Moreover, it sound effect is indeed a two thumbs up. 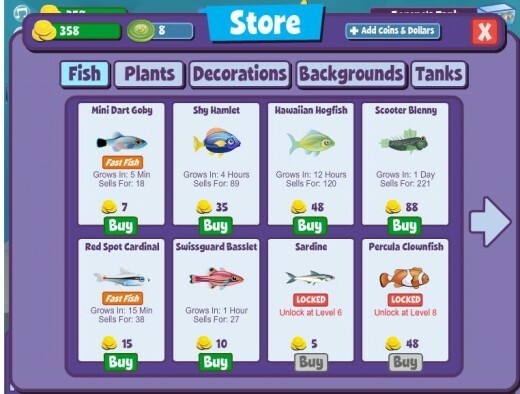 The fishes that you can buy at the store as collection or simply to increase your level and coins by raising and selling your fishes. Make your fish tanks a sight to behold with these wonderful decorations or ornaments. hi GH, geezzz this is going to be addictive game alright! I dont usually play games nowadays because have no time for it, my children in will love this one! hows the cutie avatar there? Okay, GH. I can already tell that this game is super-addicting. I'll really fail in editing my novel if I start playing this! I'll stay away for now, but will try it out later! Thanks.